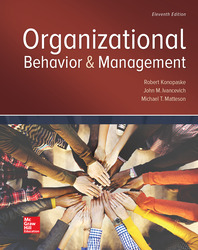 - Combines text, self-learning exercises, group participation exercises, and cases to build student’s desire to predict the behavior of people in organizations. - Managers must be able to probe and diagnose organizational situations when they attempt to understand, interpret, and predict behavior. This edition encourages the development of those probing and diagnostic skills.